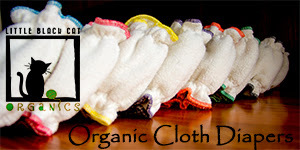 Cloth Diaper Contests & Giveaways: "Beyond Bums" Feature: Piggy Paint from Sprogs.ca! "Beyond Bums" Feature: Piggy Paint from Sprogs.ca! As I sit here tap, tap, tapping away at the keys for all these "Beyond Bums" features this week, my nails are a gorgeous shade of magenta! It's fun to go around feeling so pretty with fingers and toes done up right in fun & funky nailpolish! I haven't worn nailpolish at all since before I was pregnant with Baby Aurelia as I, like so many of you, was paranoid about all the toxins in polish that can get absorbed through our porous nails. I remember last summer, sadly sitting by the lakeshore, gorgeous with a bulging belly in a bikini, but with sad little naked toenails! Even after I gave birth, I was still leery about using polish (and so many other beauty treatments and cosmetics) because they are just so laden with tons of garbage that our bodies don't need, pregnant or not! So, I am absolutely thrilled to have found an amazing product that I've never heard of before--Piggy Paint, via local online boutique, sprogs.ca! First off, I should tell you a little about Sprogs! 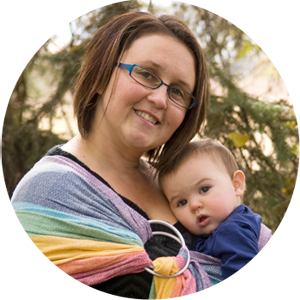 Sprogs was created by stay at home mom, Nicola, who spends her days at home with 3 kids under the age of 5 (wow! Brave lady!!). She wanted to create a fab little online boutique that could be a "go-to" destination for elusive and hard-to-find kids' products that are unique must haves! Nicola, who heralds from England, now lives in Canada and operates her shop from her home base in Edmonton, AB. She is passionate about also finding terrific quality products created by work at home moms (and dads!) who are out there dreaming up neat things for kids! Speaking of kids, when it came time to deciding what to name her new little foundling shop, Nicola had no trouble settling on the term sprogs, which in her native England is a slang term meaning "kids". 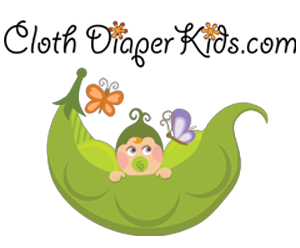 Sprogs.ca carries all sorts of wonderfully surprising items, like baby biker boots, gorgeous bink links, "Heat in a Click" bottle warmers, remixed baby-friendly music CDs (lullabyes by Radiohead, anyone? ), kids' decor, books, toys, aprons, reusable swim diapers, and so much more! Piggy Paint is a natural eco friendly nail polish designed for fancy girls. Its non toxic hypoallergenic formula makes it safe to use on all piggies. Piggy Paint’s hypoallergenic, odorless formula makes it gentle enough for sensitive hands and noses, yet dries to a hard, durable finish. There are no toxic chemicals; it’s free of formaldehyde, toluene, phthalates, Bisphenol A, ethyl acetate and acetone. - Safe for use during Pregnancy! Because it's free of all that horrid stuff (and water is actually the number one ingredient on the bottle! ), you really can use this on young girls, pregnant women, and anyone! I considered painting 8 month old Aurelia's little toenails until I took a look at them and saw that the last few were practically microscopic. I think I'll have to wait for her miniature feet to flesh out a little before we can take that official plunge! Plus, with her teething and gnawing on her hands day and night, I didn't really want to paint her fingernails quite yet, with anything--non-toxic or otherwise! So, with not much complaining from me, I invited my sister in law over and we decided to paint each other's nails! It felt like the good old days, in junior high school, when I changed my colors weekly, according to my mood. 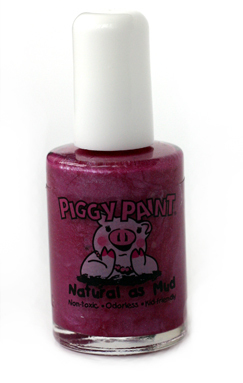 This Piggy Paint comes in tons of fun and wacky colors perfect for fun, vibrant girls! I selected "Girls Rule", a nice fuschia/magenta type color, but it also comes in "Mac and Cheese", "Dragon Tears", "Dandelion Dance", "Solar Power", "Clouds of Candy", "Forever Fancy", and many more (don't you love those names?). I will mention that the bottle does recommend using Piggy Paint's topcoat & primecoat for best performance, but since I didn't have those (nor did I want to pull out my dingy, 10 year old bottle of topcoat from some scary drawer), we left it at that. After a couple of days of heavy duty dishes and such, the nails did start to show signs of wear & tear and chipping, so the topcoat probably wasn't a bad idea. Sprogs does also carry the set of 2 (topcoat + primer), so it might be worth considering if you want your nails to last through the week to a big occasion on the weekend (especially if you're a mom who's as hard on her nails as I am!). Additional to that, Sprogs also carries Piggy Paint's nailpolish remover, which contains no solvents and has added aloe vera and Vitamin E for your cuticles! Well guys, I don't know you, but I feel like I'm ready for summer with my flip-flop ready piggies! BUY IT: Visit Sprogs.ca to pick out your very own Piggy Paint, just in time for summer! It's only $10.00! You can also visit Sprogs on Twitter. Altogether, 6 fantastic prizes (including one grand prize) will be up for grabs at the live Beyond Bums Gala on our Facebook page on Friday, May 6th at 9pm CST. Mark the date and join us then for lots of terrific fun, chatter, and flash prize giveaways!! Final details: I received no financial compensation for this review or giveaway, though I did receive the sample item free of charge. All opinions shared are my own, and I was not persuaded to share anything other than my own thoughts. Other users may have different experiences with this product than what I have shared. One randomly selected winner will receive the same prize item during our live Facebook giveaways on May 6th, and the prize will be supplied and mailed out to the winner by the sponsor of this giveaway.